He’s criticised for not speaking out on Brexit, but that’s because he’s been addressing the problems that are more relevant to people’s daily lives. Another day, another raft of votes on Brexit while every other issue is ignored. 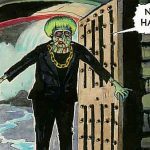 As Theresa May faces another series of Commons showdowns, there will be all the usual political drama and little in the way of substance. A lot will be written about the importance of these votes, with each amendment described and analysed in excruciating detail. 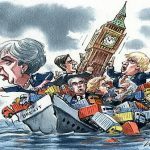 But although the votes could certainly tweak our immediate direction in terms of Brexit, there is still no sight of an end to the chaos of this Tory Government. That is partly because the route out of the current chaos does not rest with solving Brexit alone. The major problem with a second referendum, or a so-called “People’s Vote”, is that the fixation with the vote to leave the European Union continues to ignore the actual reasons that people voted Leave. For many, though not all, their vote was used as an opportunity to hit back at the establishment. It is hard to argue with the fact that the current administration is failing a majority of people in this country. The decision to turn the Leave vote into a nationwide, televised drama has only further exposed this. As the Brexit argument has rolled on, other issues have been continually delayed and ignored. Two-thirds of children in poverty live in working families, and the number of people in poverty is growing by roughly one million a year. The foobank network Trussell Trust reported that it issued more than 1.3 million three-day emergency food supplies last year. That is a 13 per cent increase from last year, when foodbank use had already risen by 6 per cent between 2017 and 2018. Last month, the charity Shelter reported that at least 320,000 people in the UK were homeless. It admitted, however, that this figure was likely to be an underestimate. Amid all the Brexit noise, these figures are hidden at best, and ignored at worst. 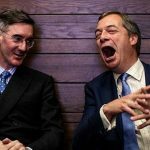 The fixation with Brexit has completely upended any other discussion regarding the very serious problems that we face as a country. 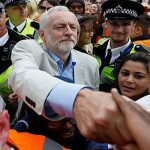 Jeremy Corbyn has been criticised for not speaking out on the issue of Brexit, but that is because the Labour leader has been addressing the problems that are more relevant to the daily lives of ordinary people. Corbyn is criticised if he dares to deviate from the subject of Brexit, such as when he questioned the Prime Minister on local bus services ahead of her announcement at Chequers. The fact that many people mocked him for concentrating on an issue that affects hundreds of thousands of people every day shows how far removed some commentators have become from ordinary lives. In the country at large, people are sick of hearing about the referendum. They are also seeing at firsthand that our public services are falling apart, people are working harder for less and household debt continues to balloon. The impact of austerity, which was felt before Brexit and will be felt long after we leave the European Union, continues to damage the lives of people across the UK. Much of the Brexit boredom comes from a place of confusion. It is entirely understandable that people wonder why the major problems affecting their lives are completely ignored by the establishment. 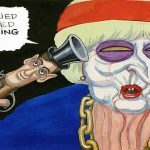 Corbyn is right to steer clear of those suggesting that the solution is a second referendum, or that he should involve himself further in this mess that was created by the Conservative Party. When it comes to Brexit, people fear that an establishment stitch-up is on the cards. Such a feeling led to the vote to Leave in the first place. To emerge intact after this chaos, Labour must present itself as the antidote to that feeling, and not as part of it. 2 March 2019 ¡NO PASARAN! 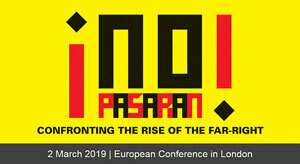 Conference in London to organise against Europe-wide rise of the far-right. Bringing together activists, MPs, campaigners from across Europe.